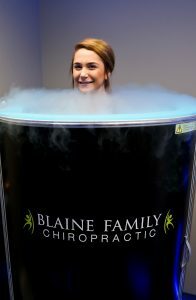 Cryotherapy, which literally means “cold therapy,” is a technique where the body is exposed to extremely cold temperatures for several minutes. Cryotherapy can be delivered to just one area, or you can opt for whole-body cryotherapy. The theory for whole-body cryotherapy (WBC) is that by immersing the body in extremely cold air for several minutes, you could receive a number of health benefits. The individual will stand in an enclosed chamber or a small enclosure that surrounds their body but has an opening for their head at the top. The enclosure will drop to between negative 200–250°F. They’ll stay in the ultra-low temperature air for between two to three minutes. You can get benefits from just one session of cryotherapy, but it’s most effective when used regularly. Infrared saunas help your body release a number of toxins, including heavy metals like mercury and lead, and environmental chemicals. The benefits don’t stop there. With infrared sauna technology, you can also lose weight, relax, relieve unwanted pain, increase your circulation, and purify your skin. The Cryo-Facial is a cryogenic treatment which beams vaporized liquid nitrogen across the forehead, cheeks, nose and chin. Different from the cryotherapy chambers that can be used for pain relief, the facial targets helping the face look younger. A Localized Cryotherapy session lasting only 5 to 10 minutes has benefits that exceed hours of traditional icing. The blood vessels constrict, immediately decreasing inflammation and swelling in the affected area by rapidly flushing the tissue of fluid and waste. As the body begins to warm, the area is flooded with regenerative blood flow. This allows for a greater range of motion in the targeted area as well. Cryo-Fat Freezing is a state-of-the-art cool sculpting technology that enables non-invasive and non-surgical body contouring. Cryo-Fat Freezing works by freezing away stubborn fat using a targeted cooling process of 30 minutes. If you have any questions about our services, please contact us today at (763) 786-5585.